Smart Speaker Market size is set to exceed USD 30 billion by 2024; according to a new research report by Global Market Insights, Inc. The global shipments are set to grow at over 33% CAGR between 2018 and 2024. The smart speaker market is expected to witness a significant growth due to the increasing penetration of smart homes across the globe. Several factors, such as growing need to increase consumer convenience and growing network connectivity, will drive the demand. Companies are integrating these devices with intelligent home appliances such as humidifiers, Ikea lightbulbs, thermostats, and salt shakers. In 2018, Baidu launched Sengled, a smart speaker that also performs the functions of an intelligent light. The smart speaker market is expected to witness a surging demand due to the increasing demand for personalization. The majority of early adopters of these devices are affluent, educated millennials. However, the devices are gaining traction among other demographic groups such as young gen X and children. These devices allow a high degree of personalization that appeals to consumers, propelling the smart speaker market growth. Increasing concerns regarding compatibility are expected to restrain the smart speaker market size. The new devices, such as Sonos One and Samsung Bixby, are facing compatibility issues with devices such as Belkin’s WeMo range of switches, Philips Hue, and LIFX. Several devices and standards only support one system. For instance, Google Home is not compatible with the Amazon Fire TV and Amazon Echo is not compatible with Casting technology by Google. This will restrict the smart speaker market demand over the forecast timespan. Advertising on these devices will propel the growth of smart speaker market size over the next few years. Businesses are increasingly experimenting with advertising via these devices due to their increasing popularity. Several companies, such as Burger King, VoiceLabs, and Oprah’s Favorite Things, have debuted on the IVA-enabled devices. The companies are implementing several policies to regularize the advertising on these devices. For instance, a policy by Amazon allows music services, such as Pandora and Spotify, to advertise on the platforms. 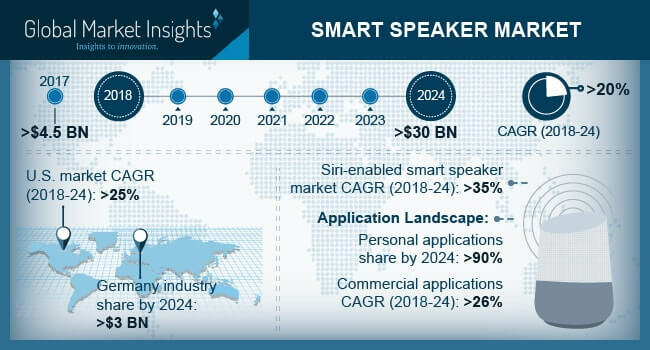 The smart speaker market in commercial applications is expected to witness a tremendous growth of over 26% by 2024 due to the increasing usage of these devices by several service providers. For instance, Deutsche Telekom has announced the usage of Amazon intelligent devices to provide services such as radio player and EntertainTV. The increasing usage of IVAs in the healthcare industry is expected to open new growth opportunities to the smart speaker market. These devices will be incorporated in the patient’s room in hospitals that will allow the patients to forward updates and requests to doctors and nurses through voice controls. The integration of these devices with platforms, such as building management systems, will allow the adjustment of window blinds and lighting. Several organizations are partnering with technology giants to develop such devices with advanced security. For instance, the Thomas Jefferson University Hospitals and IBM are jointly developing smart speakers that respond to a set of specific voice commands. The Germany smart speaker market size will witness a growth to reach over USD 3 billion by 2024 due to an increasing use of home automation in the country. Several players in the country are developing these devices to cater to the exponentially increasing requirements of the consumers. For instance, researchers at the Fraunhofer Institute for Digital Media Technology are playing a vital role in the development of these devices by designing a combination of loudspeakers and microphones for smart voice control. The key players in the smart speaker market include Apple, LG Electronics, Sonos, Ultimate Ears, Panasonic Corporation, Invoxia, and Baidu. The industry is characterized by the presence of a large number of players with intense competition. In addition to the existing players, several new players are taking initiatives to enter the market. For instance, in February 2018, Samsung Electronics announced that it will launch a Bixby-powered intelligent device by December 2018. With the introduction of these devices, the company is planning to compete with products such as HomePod and Google Home.